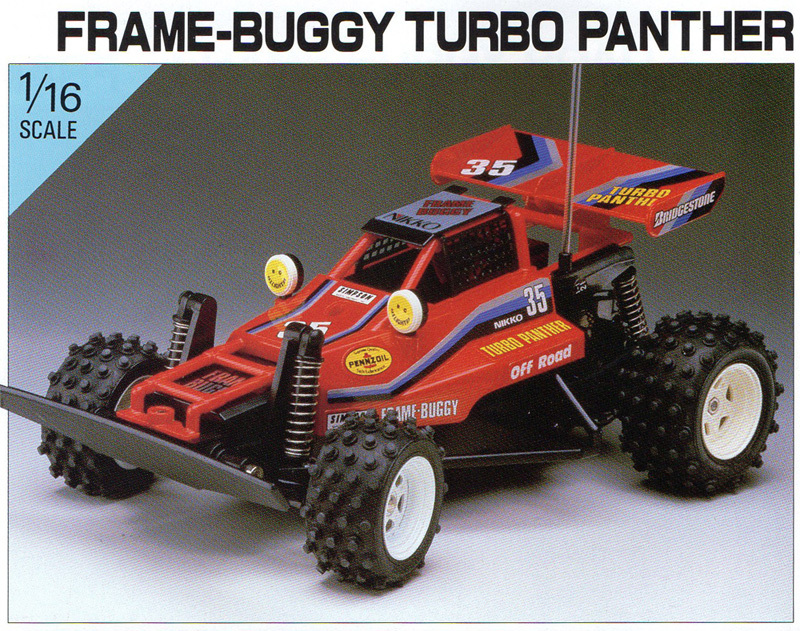 The Turbo Panther was Nikko’s perfect little R/C buggy for 1986 – probably the peak year of the R/C buggy craze, when they were among the hottest toys in the world. Looking like a smaller version of the more expensive 1/10 scale buggies, yet still quick for it’s 1/16 scale, it was a big seller both in Japan and abroad. It even had it’s own TV commercials and was a direct rival for Taiyo’s Jet Hopper, released the same year. 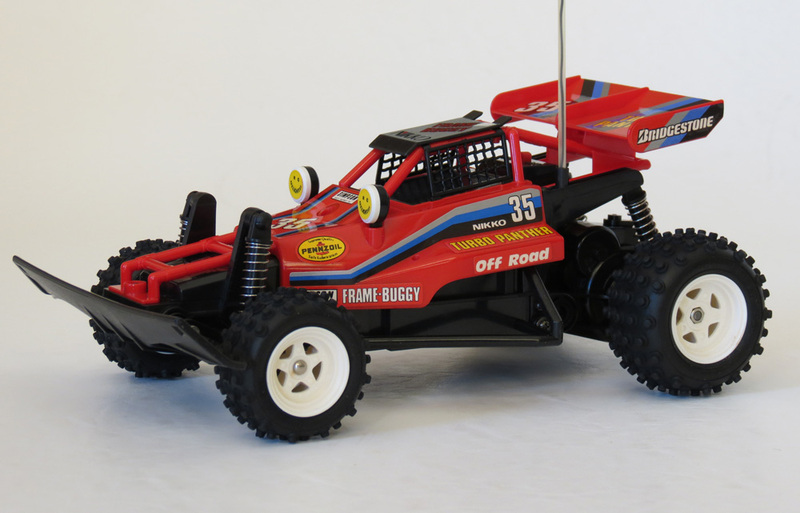 When hobby grade R/C companies first began releasing electric off-road buggies in the late 1970s, a “buggy” usually meant something that looked like a VW-based Meyer’s Manx style beach buggy. 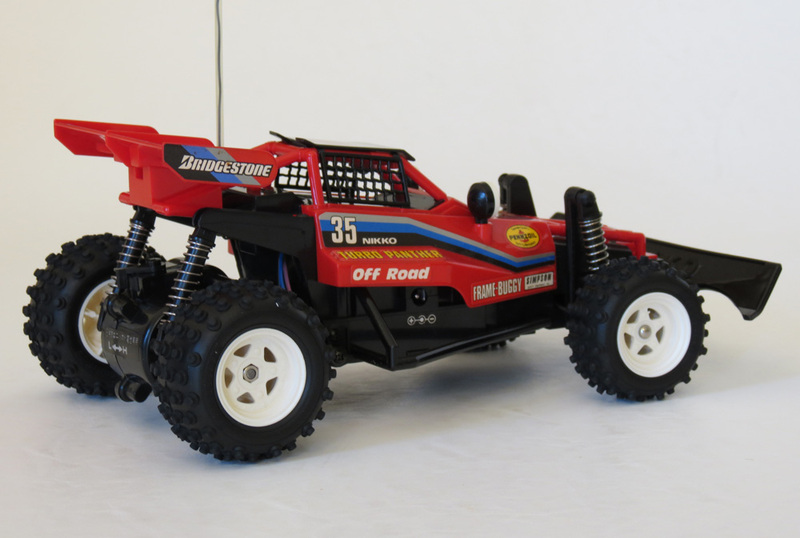 By the early 1980s however, the designs were following a more pipe-frame buggy look, such as those raced in the Baja 1000 and Mint 400 events in the USA. By the mid-1980s, R/C car designers were beginning to break away from pure realism and add their own twist to their toy designs. This usually meant more body panelling and a rear spoiler, enabling the car to carry more decals, slogans, colours – and character. These mid-1980s buggies still had a sense of real-world, practical application about them. You could imagine them being driven in real life, in the Baja 1000 or the Paris-Dakar Rally. Yet they were also quite individual and looked like they were designed to be toys, rather than to look like precise scale models. Mk1 – Notable for smooth, straight-ribbed front tyres. Nan Jou Turbo Tiger. A Taiwanese-made clone of the Mk2 Turbo Panther. Known in some markets as the “Turbo Blaster”. This mid 1980s period – let’s call it 1984-1987 – was also when R/C buggies experienced their peak popularity. Kids and adults alike took to R/C in droves. And most (not all, but most) of the popular buggy models that we remember were released during this time. Everything from The Hornet, the RC10, the Marui Hunter, the Taiyo Jet Hopper, the Tandy/Radio Shack Golden Arrow, Schumacher CAT, Yonezawa Land Dash and dozens more – all of these actually hail from a few years in the mid 1980s. And to the trained eye are easy to spot as belonging to the exact same period, even though they had very different performance levels. Nikko’s first three buggies in the post-beach-buggy era were a series of 2WD cars inspired by the robust design of The Grasshopper, from Tamiya. They were called the Road Star, the Bison F10 (both 1/10 scale), and the Black Fox (1/14 scale). 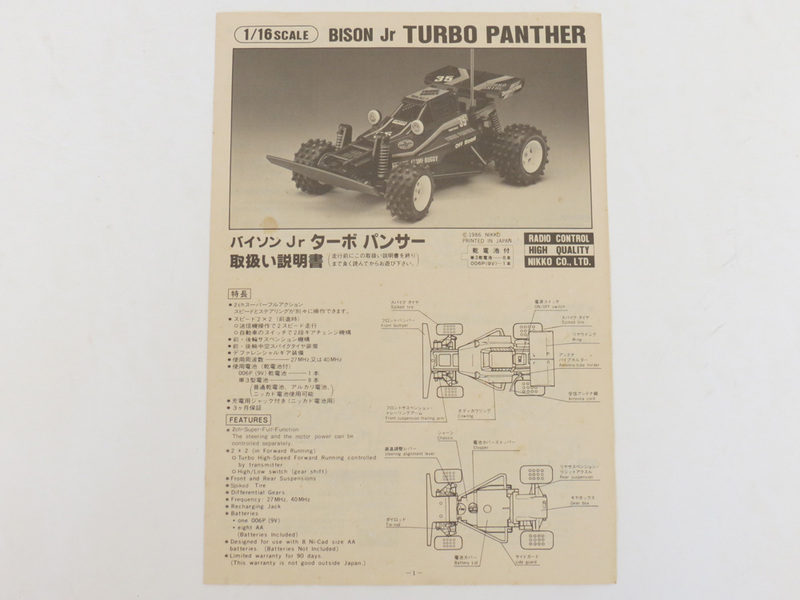 Among these, the Bison F10 was particularly successful at stealing a few sales from market leader Tamiya in the 1/10 scale category, thanks to the fact it was a similar car – but required no assembly. It’s full-bodied, colourful design and animal-based name (a huge trend at the time thanks to Tamiya) also made it attractive. But it was still over 40cm in length and 1/10 scale. And when I was a little kid, the first time I laid eyes on a 1/10 scale buggy, I thought it was enormous! Not everyone wanted (or could afford) something that large and fast. So there was certainly room in the market for more vehicles in smaller scales, to be sold in mainstream retailers. So in 1986 Nikko released a miniature version of the Bison F10. On the box they even called it “Bison Jr Turbo Panther” to draw the connection. Looking like a gorgeous, and perfectly proportioned little version of the Bison F10, this was a compact racing buggy for the backyard, complete with fat, spikey rubber tyres all round, some faux window netting, genuine sponsor logos and working suspension. The Turbo Panther ticked all the right boxes – offering the looks and excitement of a 1/10 scale car, at a more affordable price and a more manageable size, particularly if you were new to R/C. And in a market that was still new, Nikko – by then already the top-selling ready-to-run R/C brand in most countries – were onto another big winner. At this point I should probably explain a bit about the two variants of this model. The one you see featured on this page is a Turbo Panther Mk2 – the second type ever released. Notice the spikey front tyres. The first Turbo Panthers originally came with different front tyres – a smooth type – giving them a look which was more similar to it’s bigger brother the Bison F10. Both variants found their way outside Japan. I had earlier stated in this article that the spiked tyre version was the first, but I have since amended my description here. Personally, I actually think the spikey tyre look is the better one. It suits the car’s proportions better. There’s also the benefit of better front-end grip. More interesting than the variants though, is the question of the obvious rivalry between this car and Taiyo’s popular Jet Hopper. Since they both came out at the same time, which one was better? I’ve written at length here in the past about the popularity of the Jet Hopper, but the reality is: Nikko probably sold just as many if not more Turbo Panthers. Can you believe this toy is now 30 years old? It’s also funny to think about how well put-together it’s design is. Simple, but attractive. It seems “just right”, and not overdone. This car is really a perfect 1/16 scale version of the exciting 1/10 scale buggies of the mid-1980s – from every angle. Of course, Nikko had already achieved all this in 1/14 scale with the Black Fox a year earlier. The Turbo Panther however, ditches the longer body lines and some of the chrome, and keeps things colourful, compact and it has to be said – cute. Smaller, and yet it still takes 8 x AA and delivers significant speed for it’s size. If you’re wondering which came out first – the Jet Hopper or the Turbo Panther – well at the time of writing I still have no idea. Both were released in 1986, that’s all I know. And when comparing the two, there are certainly advantages and disadvantages on both sides. I think it’s safe to say that Nikko invented the “Turbo” idea. In 1985 they released several cars – both on and off road, including the Black Fox, that debuted with those shifting forward-reverse levers with “Turbo” mode, enabling kids to enjoy the idea of two levels of speed and the “option” to blast ahead of your rivals when necessary. Of course, we all just blasted our cars around in the Turbo mode non-stop. Despite it’s size, I also think the Turbo Panther looks quite rugged in design. At least, it looks that way. The front bumper is quite huge and the 4 x spike tyres on this original model look like they are ready to go anywhere. They even make this car seem like a 4WD – but alas it’s not. The suspension is rolling-rigid rear axle, and independent suspension at the front. It works well for a car of this size. Sure it’s bouncy. But the springs are neither too soft, nor too hard – they’re about as good as they can be for the size and weight of this car. If you were buying some sort of comparable R/C buggy from a toy shop today, the suspension might very well be entirely fake with fake plastic springs and arms. A lot of today’s R/C toys seem like they were made clueless cloners in a chinese slave factory – because they were. Not so back in the 1980s. Nikko may have been the minnow of the R/C market in a “hobby-grade” sense, but they still did everything for real – from their tyre rubber, to their designs, to their catalogue photos. Surprisingly, over the years this front bumper proved to have a flaw where it could break off under heavy impacts. And this brings me to probably the main flaw with the Turbo Panther – the fragility of the front, and rear wing areas, during impacts. Truth is, the car went so well that it was fast enough to cause itself some damage, and there was no flexible lexan body to save it. Those exposed “frame” portions are commonly found broken today, on any cars that were driven hard and smacked into lots of kerbs and walls. But every R/C car had a weak spot or three. And what the Turbo Panther lacked in one design area, it made up for in others. For instance, unlike the Jet Hopper, the Turbo Panther had a working differential. And while Jet Hoppers were great at doing burnouts because both rear wheels were always blasting at the same rate and trying to find traction, they were also great at destroying their tyres and wearing the knobs down to nothing. To this day, most surviving Turbo Panthers still have more tyre tread left than the average Jet Hopper, thanks to the simple fact that Nikko embraced differentials in their cars as early as possible, giving them a more sensible displacement of traction. Nikko seemed to have an ongoing connection to Bridgestone, so it’s no surprise to me to see this brand on the tyres of this car. Fun fact: In 1989, Bridgestone provided at least one actual part (a drive belt) in the kit for Nikko’s 1/10 Dandy Dash buggy. The tyres on the Turbo Panther are excellent quality, and it would be hard to distinguish the rubber from anything in the Tamiya stable from the same era. 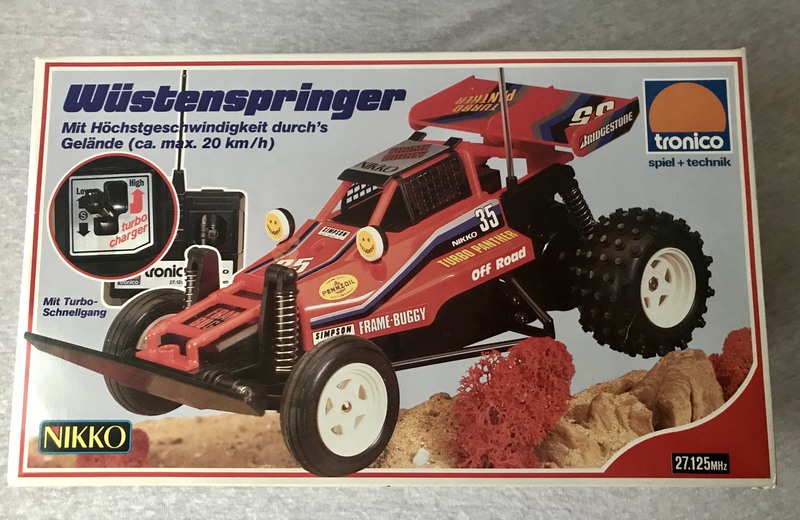 Don’t you miss the days when even a small off-road R/C buggy you might find at a department store, came with decals like these? The colour-band stripes were the typical look for the time, while the Pennzoil, KC Daylighter, Simpson and others, are all real brands. They were probably used without too much in the way of permission too. The times were a bit more relaxed back in those days. The Turbo Panther Mk1 also came in two colours – red as shown here, or black. Powered by 8 x AA batteries and a Mabuchi RC 280 R90T motor, the performance of this little buggy is another area where it excels, and is justifiably fondly remembered. With a noisy whine, “Turbo” mode will gladly take the Turbo Panther up to about 20Km/h – according to the official numbers. There’s more than enough power to scuttle along off-road trails or around a short racing track in your backyard. It was never meant to compete with the Tamiyas, Kyoshos, Maruis and other larger buggies with 540 motors. But it nearly did in some ways – consider for example, that the official top speed of a car like the Tandy/Radio Shack Golden Arrow was supposed to be about 22Km/h according to the Tandy catalogues of the time. You wouldn’t think the two would be quite so close, but apparently they were. Taiyo’s official top speed for even the earliest Jet Hopper was 23km/h. While the Jet Hopper Mk3 received some tweaks that actually took it to a supposed 27Km/h – and these do admittedly blast along. I haven’t specifically compared the Turbo Panther in an outright drag race or a speed check yet with any of these cars yet, but one day I will – in an effort to settle the score once and for all. At the very least, there is no doubt that the Turbo Panther offered legitimate off-road fun and could easily kick sand in your face. The transmitter was quality gear too and offers good response for it’s simple functionality – albeit at the typical short range of cars of this price range. Another great feature of the Turbo Panther was that the steering did not require the car to be moving in forward or reverse for it to operate – unlike the early variants of the Jet Hopper (though Taiyo later rectified this with the Jet Hopper Mk3 revision in 1987). 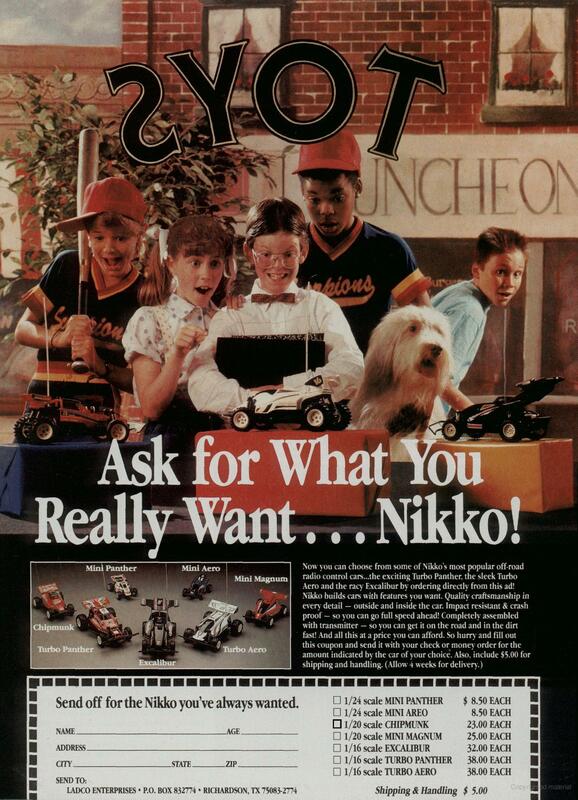 A popular model for several years, this print ad from late 1988 shows that the Turbo Panther was still among Nikko’s range in the US market. The model was a strong seller right until the start of the 1990s. There’s no doubt that the Nikko Turbo Panther is one of the all-time classics. It was in some ways, the start of a hundred buggies Nikko released over the years, until they had all but saturated their own market. Nevertheless by being one of the first, and by being such a good looking and capable buggy, it was the starting point in R/C for literally thousands of people around the world. I would love to know how many were sold, because there’s a very real chance that the numbers are comparable to those of any popular R/C buggy you’d care to mention. 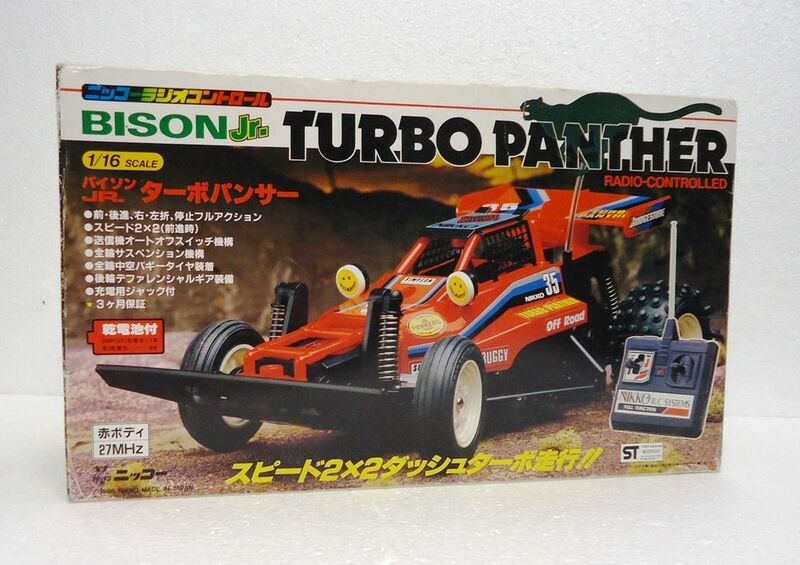 Today the Nikko Turbo Panther remains fairly plentiful on the used market, but as always, finding one in great condition with the original box is the challenge. Wrecks can cost as little as a few dollars, but mint/boxed examples will easily fetch hundreds – and you are likely to be fighting against lots of other people who want to relive their childhood memories. 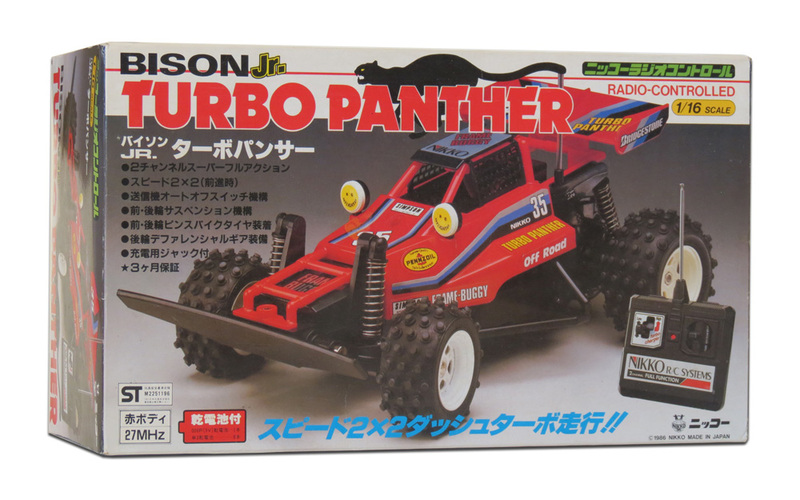 If you’re a fan of mid-80s R/C buggies, and you appreciate that the ready-to-run models were something special back in those days, then you’ll already know that the Nikko Turbo Panther is must have. Another true legend in R/C toy history. The Turbo Panther is relatively easy to find, but extremely hard to find in mint condition. Coming ready-to-run out of the box means most examples are well used. In addition, you should check any used examples of this car for damage to the front and rear of this model, as it has proven somewhat vulnerable to impacts. Spotlights – these are a common piece that is broken off and missing on used examples. Front bumper – this had a weakness of design that has left many examples with the bumper broken off due to heavy impacts. The problem stems from the screw mounts holding the bumper to the chassis, which often broke off. Front impacts may also have damaged the exposed body frame near the nose. Rear wing supports – these can often be found broken, resulting in the wing being detached. You do such an incredible job writing this blog. Extremely detailed, educational and superbly written. I can’t wait to hear your thoughts on the re-release of the Optima! Cheers 🙂 The Kyosho Optima will get some attention in coming months, more so the original though. I have one used. Still in the box. I pulled it out the other day…. The RC didn’t turn on, well the light on the control did, but that was it. So I put it back in the box and put it back in the cupboard. All parts and everything in the box is still original too. Just gonna be a dust collector for now. Such a great article. And very surprising information about the front tyres. 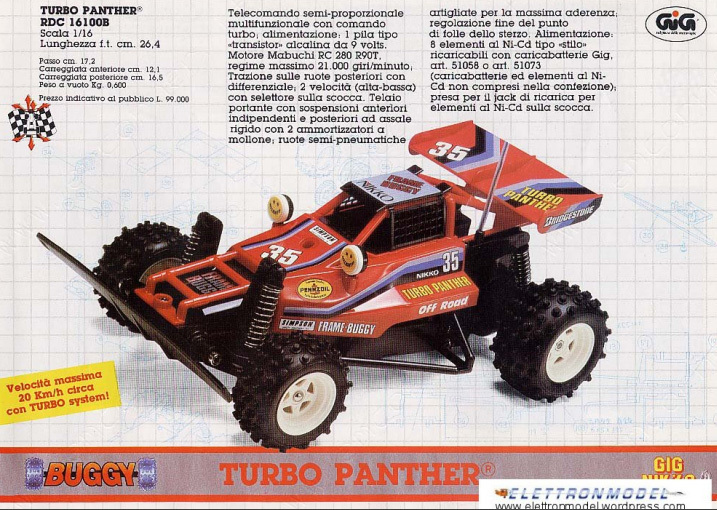 The Turbo Panther was my second RC as a kid back in the days (my first was a Taiyo Wheelie Challenger). I remember my home town going crazy with this buggy. Every boy in my age group seemed suddenly to have one. It was amazing. Some time ago I had a visit from one of these boys from back then, and I showed him my new purchase. And he imidiately responded “A Turbo Panther! But mine was red and with smaller and grooved front tyres”. Yeah, everyone had one back then. In my home town the Turbo Panther definitely won the battle against the Jet Hopper. Found my old five Taiyos and Nikkos in 2013, and it spawned a new interest. Today 2-3 years later my house is filled with Tamiyas and Nikkos and Taiyos. Thanks for such a great comment Simon. I agree that the narrow front tyre version was the first version of the Turbo Panther. And it also sounds like the Turbo Panther was a massive hit in Denmark (who knew!). And yes, those front roll cage areas are fragile as you mention, as is the rear wing. 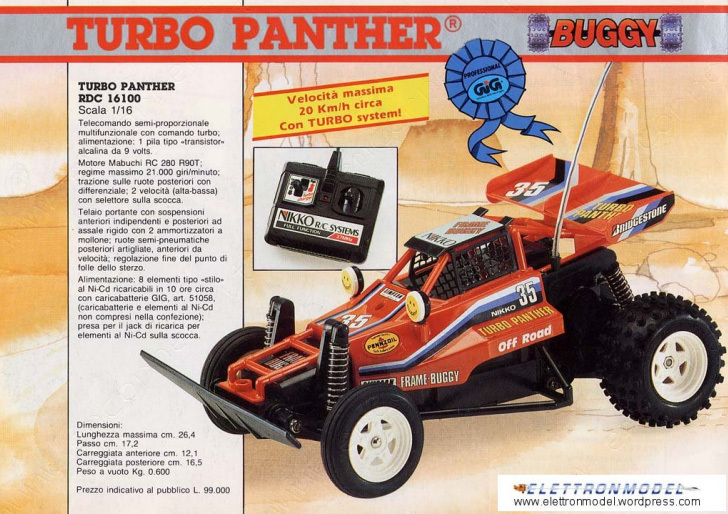 Nevertheless, the Turbo Panther was a fast little buggy – the perfect product for it’s time. Great to hear your stories, and hope you will keep stopping by here (many more Tamiya, Nikko, Taiyo and other articles to come). I just wanted to mention Simon, that after initially writing this article, I have since corrected it to state that the variant with the smooth, straight-ribbed front tyres (which you had) was actually the first type (Mk1). Great article! thanks for sharing!I have the european version ,where cood i finde the front tires? Hi Alex – unfortunately I am not aware of tyres for the Turbo Panther ever having been sold as separate spare parts by themselves. Your best bet these days is to find another, non-working parts car and take the tyres from that (on the bright side, there are quite a lot of broken Turbo Panthers out there for sale). Super article. Interesting information and facts. I have a question, I have a Europeaan version with smooth tyres at the front, the car can only turn while driving forward or backwards. Is it possible there are two versions of electronic print boards for this model? Cheers Wouter. Very interesting info you have there. It is very possible that there were 2 versions of the circuit board in these cars. I wonder if all of the European released cars (with the smooth front tyres) behave in this way? It’s almost as if this more basic system would have been the earlier type. I have amended this comment, as I have since learned that the Turbo Panther with the smooth front tyres was the first type (Mk1), around the world. As a Turbo Hopper owner whose best friend growing up was a Turbo Panther owner, I can tell you the Panther was the better car on the road, while the Hopper was better off road. The Panther accelerated quicker than the Hopper. However the lack of a differential gave the Hopper an edge off road. the Panther would get stuck much easier than the Hopper. Thank you for this long and obviously passionate description and history of the Turbo Panther. It is the best article i found about ut so far. I will bookmark and check your site from now on ! Some weeks ago i’ve got the chance to put my hands on a black Mk1 version (late 80’s European package, France, probably 1989/1990 or even later (?? the controller is the pistol like shape reciever….. have you ever seen a Turbo P. sold with that ??). It is quite nervous, and fast also ! That’s a great point. And as you explain in your article it is very very well thought and made. Not just Red and Black! And check out the decalnumer: the red one pictured here had number 35.. while the Black, White and Yellow ones all had number 85 and were fitted with the ’87 ‘smooth type’ front tires. Woops… correct me: the Black, white & yellow ones also came with spikey front tires… sorry! I recently just found one in a thrift store without a receiver. The car is pretty intact, except for its missing the back tail and the 2 spotlights. Also the spot for the antenna is broken. The wire is there. I was looking for more info on the car before deciding what to with it, when I came upon your blog. Very well written and informative. While researchig I’ve noticed that there only seems to be mentions of the car being numbered 35 or 87. I have one that is numbered 90. Was this a rare number? The car I have is marked on the bottom as 1986 and was made in Singapore. I was under the impression that it was made in Japan. Any additional info you may have is greatly appreciated. Thanks to your blog for the history is these cars. My heart swelled with pride that my little white mk1 had such a great following and history. The rear wing has been glued back on and the front tube frame, just behind the front bumper is cracked and separated. Small details, but otherwise it still looks great. 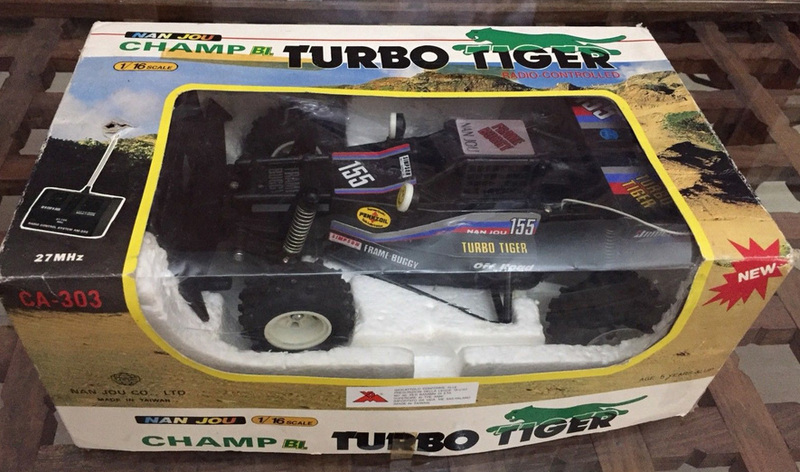 I got my Turbo Panther new for Christmas in 1987 or 1988, I was 7 or 8. I still have it and just recently retrieved it from a box at my parents. I have many great memories of this little machine. It was indeed fast for it’s time and was great fun on smooth concrete or indoors. As was noted, it’s biggest weakness was the open diff in the dirt. Unfortunately the rear tires were damaged from a heavy object being placed on it for several years. I’ve just sourced some on eBay, for about the same price the entire care was new. That said, I couldn’t be more anxious to pilot it again after all these years. I’ll introduce it to my three young boys, but they have their own R/C cars – this one’s Dad’s! Thank you for such a great site that’s brought new love to a very old toy!